For those who are behind on completing the general education requirements or for those who wish to lighten the load for Spring semester, the Winter J Term option might be something to look into. In its second year, it will run from Jan. 2 to Jan. 16. The J Term offers a variety of courses ranging from general education and graduate courses to domestic and international travel programs. Olerio describes COM 100 as one of the “staples” of the J Term because of its popularity last year. There were three sections last year and three sections are already lined up for this year. FLM 101 and JOR 110 are additional examples of general education courses that will be offered again this J Term. Various graduate courses to be offered include CMD 586X, Multisensory Instruction in Language and Literacy. HDF 597, which will focus on mediation as a means of conflict resolution and AFS 531 as Fisheries Stock Assessment. New to this year’s J Term are three courses for the business minor, BUS 140, BUS 449 and BUS 365. Registration is currently open until Halloween for this year’s ITR (internship) 300 courses, career-exploration courses which are designed to narrow down students’ job searches. There are five sections, including one for Harrington School students, one for Textiles students and one for Health majors. These experiential opportunities, coined “Winternships” by Olerio, will bring students throughout New England to meet with various employers and companies. 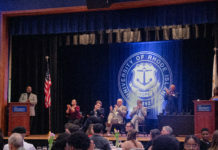 The remaining two sections, which will be located in Rhode Island, are for students of any major. The abroad programs offered during the J Term include a trip to the Dominican Republic for nursing students, which has been offered since before the inauguration of the J Term. Students will also be travelling to France, Indonesia, Italy, Germany and Bonaire where they will have the opportunity to go diving. This J Term also comes with the exciting and new trip to Cuba. For credit in political science, students will be learning about the history of the country. “Those students I think are going to be in for a once in a lifetime experience,” said Olerio. Engineering students in the International Engineering Program and International Business students also have the opportunity to travel abroad to countries such as Germany and France. In planning J Term courses, the Provost Office makes careful considerations. “The first thing that is most important to us is choosing courses that make sense for two to three weeks,” said Olerio, emphasizing that there are certain courses that just cannot be condensed into this short time frame. Last J Term, 100 students enrolled in travel courses and 300 students enrolled in on-campus courses. This year, over 200 students have already applied for travel courses, which reflects the J Term’s increasing popularity. The J Term has been designed to be easily accessible to all students. Most of the courses will be held in either Swan or Lippitt Hall and students will be permitted to park in the visitor parking lot by Swan Hall to make it easy for them to travel to class in the snowy month of January. Students already living on campus will also be able to stay in their dorms during the J Term, without an additional fee, so long as they make the appropriate arrangements through university housing upon J Term registration. It has also been important to URI to make the J Term affordable for all students. Any student with financial need may fill out the forms available online and enrollment services will evaluate and help the student with their financial needs. Registration for on-campus courses beings next Monday, Oct. 27. For a complete list of the upcoming J Term courses, visit http://web.uri.edu/jterm/courses/.